Guest blogger Jennifer Goldstein has worked in several different departments at the New England Aquarium, including the Edgerton Research Lab and the Conservation Department's Sustainable Seafood Programs. Her career as a researcher and analyst has focused on large pelagics, primarily tuna, including research into the reproductive biology and foraging energetics of bluefin tuna. More recently, she's been researching aspects of sustainability of various tuna fisheries. Jennifer recently left the Aquarium to focus her career on science and environmental writing. Here she presents a series of posts for us on the species of tuna that can be found in the Phoenix Islands Protected Area of Kiribati. 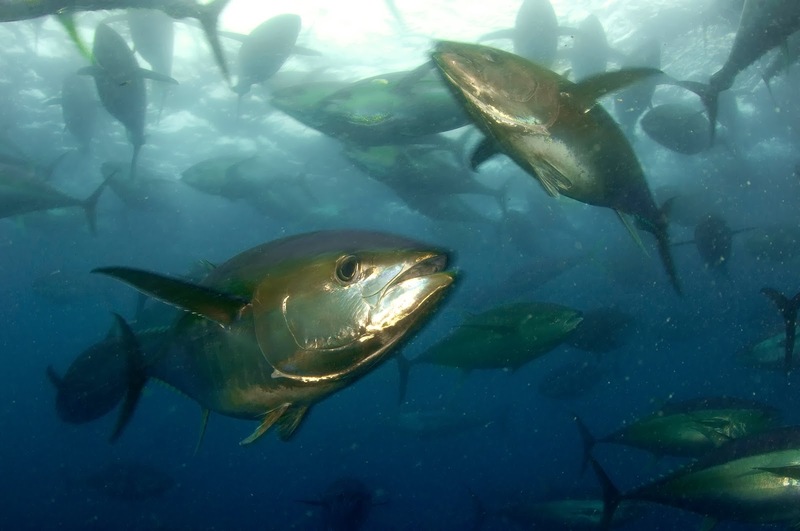 Of all the pelagic creatures that live within or migrate through PIPA, tuna are likely the most important, at least from a monetary perspective. Historical fishing data and tuna tagging studies clearly demonstrate that Skipjack tuna (Katsuwonus pelamis), bigeye tuna (Thunnus obesus) and yellowfin tuna (Thunnus albacores) are all resident in or common visitors to PIPA. One of the largest fisheries in the world, the purse seine fishery for skipjack tuna, takes place here and in the territorial waters of the other Pacific Island nations. Kiribati presently has limited capacity to fish for or process tuna caught within its territorial waters, but it is able to benefit from its tuna resources in another way: Revenues brought in from the sale of fishing licenses to foreign tuna-fishing vessels are a primary source of income for Kiribati. Determining the proper balance between conservation of tuna habitat within PIPA and continued prosperity from tuna fishing elsewhere in the Kiribati EEZ is a major goal of the PIPA Conservation Trust Fund. This is the first entry in a series of guest blog posts to share details about the tuna that inhabit PIPA, and how the biology and behavior of highly migratory species can create challenges for the sustainable management of their populations.